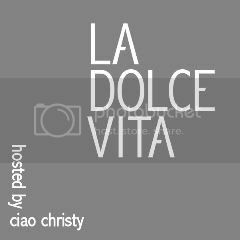 One of my "new" favorite Italian blog sites is Ciao Christy, an Atlanta, GA gal that now lives in Florence, Italy. Every Monday, she and a group of other Italophiles and expats write about the "sweet life" of Italy. One of my last trip's to Italy, I discover the wonderful tradition of "Aperitivo". No, it's not like the USA's "Happy Hour", which usually means discounted drinks and maybe mediocre munchies. An aperitivo can be anything from a great side spread of wonderful Italian specialities to a little bowl of chips. After the Roman Death March, I needed to get my mother a glass wine, pronto! The nearest spot was the Snack Bar on Piazza un Piscinula, and here's our aperitivo. See even, the little snack shop provided something for us. Here's a great explanation of Aperitivo, Italian by Ms. Adventures in Italy.